Aintree, home of the Grand National race offers top class facilities for its visitors. 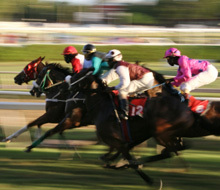 Watch the spectacle of the Grand National from any of the public enclosures around the track. Each enclosure offering great views over the circuit, you won’t miss a second of the race! If you are looking for a more memorable experience then Aintree offers a wide range of hospitality packages, ranging from a beautiful meal overlooking the winners circle where you can see celebrations and the preparations for the races ahead, up to the princess royal restaurant, and unmissable experience overlooking the finishing post of the historic race. Aintree offers unbeatable facilities off race day as well as on, Aintree Racecourse has recently completed a £35m redevelopment programme, which has seen the opening of 2 new grandstands along with the Aintree International Equestrian Centre. The 2 new grandstands can accommodate up to 600 delegates in each, whilst the Aintree Pavilion has 3,700 square metres of exhibition space. Combine this with the existing three grandstands and we really are a venue to be considered if you are hosting an event within the North West.